When you add an email address to your Outlook.com account, we send you an email asking you to verify the email address belongs to you. If you're not already signed in to this account, sign in using an email address that has already been verified. Note: If you try to sign in using an email address that hasn't been verified, you'll be asked to verify it again. Sign in to the email address you added and look for a verification email message in your inbox. 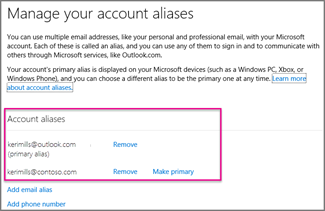 In Outlook.com, on the Manage your account aliases page, under Account aliases, you'll see the email address you added. If you're having problems with signing in, see When you can't sign in to your Microsoft account.